"This new and shiny ship belongs to a Battleship class, and is a bit more powerful in contrast to other battleships, but not in all statistics. It even has a name! Yes… You can call your new battleship 'Glycon'. Also, it's so special it doesn't have a hangar. " said Nikola Jukic, project manager for Update 2.0 and additional Starpoint Gemini Warlords content. 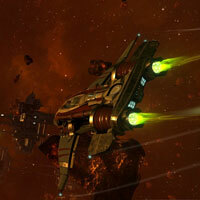 In addition to free content, Starpoint Gemini Warlords receives a myriad of bugfixes and localization improvements.